Over the past two decades or so, contemporary art has increasingly become an integral feature of major international museums primarily focused on displaying collections of ethnography, antiquities, history and culture. Equally, museums dedicated to narrating and commemorating traumatic chapters in history have also introduced contemporary art into their programmes. As institutions with often substantial international profiles these museums have the resources to offer curators and artists potentially lucrative and, on occasion, career changing opportunities to respectively commission and create new work. These opportunities often involve artists of colour and appear to be celebrated as evidence of on-going strides towards cultural pluralism, equality and inclusion. Scholars have, for some time now, been opening up debates about the politics and problems surrounding ethnographic collections and displays in western museums. Precious little attention however, has been paid to the consequences and implications of contemporary art being added to what are often already very problematic environments. What function does contemporary art serve within already culturally charged museum contexts, particularly when raced artists are used in such endeavours? Does contemporary art represent an unequivocal rejection of antiquated but long-held views of non-western art and culture? Do the favoured types of contemporary art exhibitions staged in ethnographic and other museums ultimately exist in a cultural and historical vacuum, stifling criticality and reaffirming western museums’ cultural hegemony? 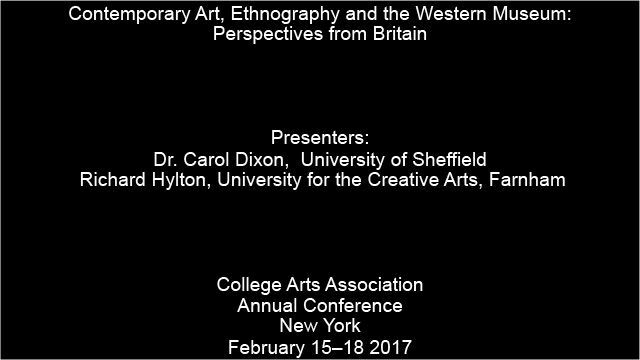 Using case studies and other approaches, this session set out to critically examine the role of contemporary art when strategically co-opted by museums. Doctoral research undertaken in the UK, France and Germany throughout 2014-16 provided opportunities to investigate the problematic provenance and historical geographies of collections of ethnography on display in Western European museums. Several of the assemblages appraised featured alongside modern and contemporary works of art in settings described as ethnographic, or re-branded as ‘World Museums’. One of the most important of these visits was to the Weltkulturen Museum in Frankfurt to consult archival documents, interview curators, and to review the ground-breaking exhibition, ‘El Hadji Sy: Painting, Performance, Politics’ (March-October, 2015). Renowned Senegalese artist-curator and scholar-activist El Hadji Sy (b. 1954, Dakar) was invited to Frankfurt to create and experiment with innovative, site-specific, themed installations, juxtaposed with historical artefacts, political poster art and documentary film. The (post) colonial legacies connecting El Sy to the Weltkulturen Museum, the cities Dakar/Frankfurt, the nations Senegal/Germany, and the continents Africa/Europe over time and space were all examined by the artist, by in-house co-curators (Dr Clémentine Deliss and Dr Yvette Mutumba) and several guest contributors from around the world. Each of their poignant narratives expressed sensitivity towards the deeply traumatising colonial past, but also optimism in relation to the post-modern curatorial turn towards ‘new museologies’. This highly visual presentation draws on El Hadji Sy’s poignant portfolio of arts activism to trouble self/other binarism entangled and imbricated within the Museum’s collections and archives. Broader ‘decolonial’ politics and pedagogies concerning issues of restitution, reparations and the dismantling of “The Master’s [Museum]” are also foregrounded in this exemplary case study. Romuald Hazoumè’s installation, ‘La Bouche Du Roi’ explores history, trauma and the legacy of transatlantic slavery. Purchased by and presented at the British Museum in 2007 it was one of the most high profile contemporary art exhibitions to be staged as part of commemorative events marking the bicentenary of the Abolition of the Slave Trade 1807-2007 in the United Kingdom. Comprising sculpture, sound, video, photography and aroma, this multi-sensory work appeared to be tailor-made for this event, not least because its re-imagining of a slave ship was influenced if not actually based on the iconic abolitionist engraving ‘Description of a Slave Ship’ (1789). Flagship argues that while the bicentenary itself provides a problematic context for ‘La Bouche Du Roi’, its presentation at the British Museum is also emblematic of a wider strategy being deployed by ethnographic institutions in commissioning and or acquiring works of contemporary art, by African artists. The British Museum has itself strategically acquired a number of other works by contemporary African artists. What may now be considered as evidence of a more pluralistic engagement with contemporary Africa might equally be viewed as a process of delimiting contemporary African art’s role to the ethnographic space, in order to legitimise an institutional modus operandi. Offering a critical insight to the British Museum’s presentation of ‘La Bouche Du Roi’, Flagship reflects on the often overlooked but increasingly influential role the ethnographic institution has in shaping discourse on contemporary African art.